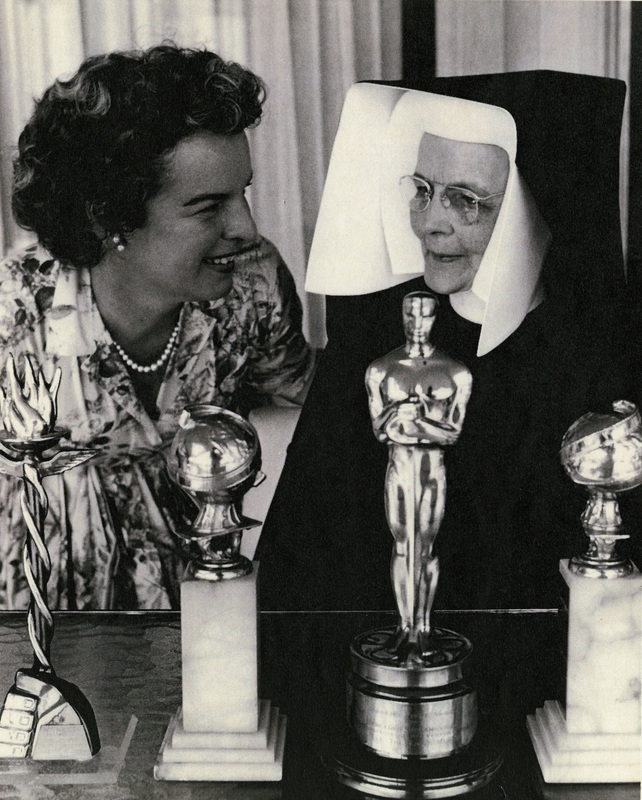 Mercedes McCambridge pictured with Sister Mary Leola Oliver, B.V.M., in front of her awards. The large majority of students at what is now Loyola University Chicago walk around the Mundelein Center for the Fine and Performing Arts without realizing its former significance as a Catholic women’s college, let alone the former training grounds of an Academy Award and Golden Globe-winning actress. Indeed, the main building of what was once Mundelein College had a rich legacy of teaching students the fine and performing arts, including one such alumna, Mercedes McCambridge. McCambridge received formal acting training from Sister Mary Leola Oliver, B.V.M., who not only served as her teacher, but as a lifelong mentor in shaping her career as an actress. This summer, my colleague Jenny Clay and I have been working on creating a web portal to showcase media featuring the reflections of Mundelein College alumnae, faculty, and staff from their time at the school. As part of the research for this project, I had the opportunity to listen to an oral history that McCambridge recorded herself where she reminisced about the impact that Sister Mary Leola had on her. McCambridge was born in the Chicago area in Joliet, Illinois in 1916. She attended high school at St. Thomas Apostle School run by the Dominican Sisters on the South Side of Chicago. The sisters wanted her to attend Rosary College (now Dominican University), where she spent her first year. Following an examination with Mundelein College instructor Sister Mary Leola, she entered the college after her freshman year. McCambridge recalls how sister demanded the best from her students as someone who knew theater inside and out. The petite instructor with sparkling eyes and notes pinned to her blouse was an actress herself who had pride in Mundelein College. Sister stressed the importance of diction and body movement in acting. She also knew everything about stage design. If sister saw herself in a particular role in a play had she been a student, she would make the student’s time in that position extremely difficult. 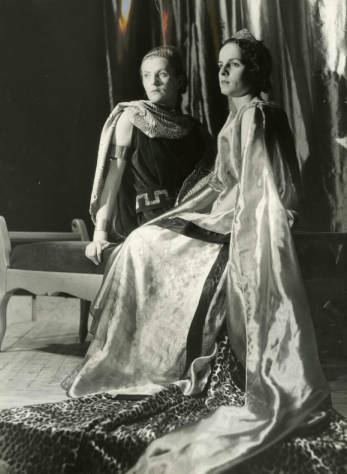 Students Margaret Cleary (left) and Mercedes McCambridge perform as Genesius and Pappaea in The Comedian. Sister Mary Leola came up with the concept of the Mundelein College Verse Speaking Choir. Editors of the Chicago Daily News and Chicago Tribune would come up to campus, and were impressed by the choir. NBC Radio heard about the group, inviting them to record one of their poems into microphones. NBC signed the choir into a year contract with the Chicago Symphony Orchestra. McCambridge, in particular, received a five year contract with the company as a result of her involvement in the Verse Speaking Choir. 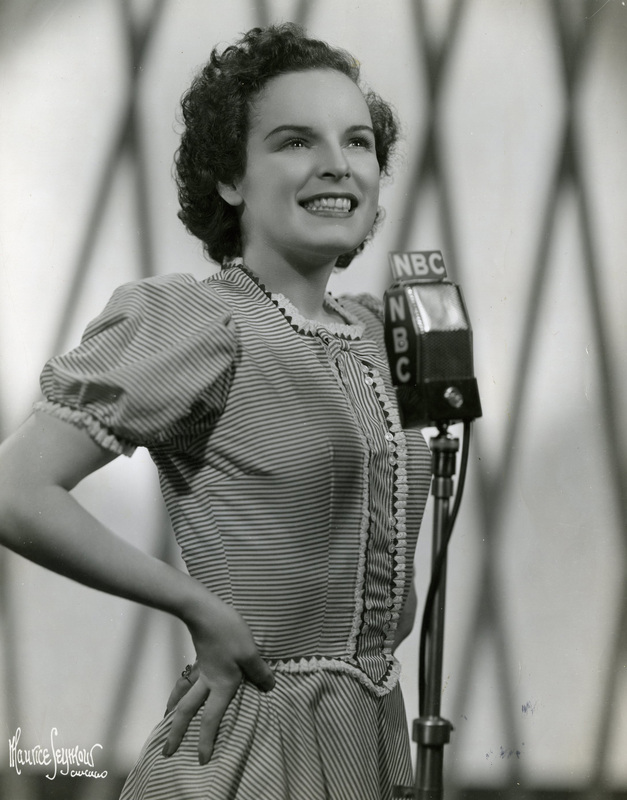 Mercedes McCambridge posing for a radio stock picture for NBC. McCambridge explains how her fame only grew from there. She played roles in theater, film, and radio. The Chicago Tribune wrote that she was the best non-traditional interpreter of Shakespeare. She claims her success not to be attributed to herself, but rather to sister. When McCambridge won an Academy Award for Best Supporting Actress in All the King’s Men, she sent the award to sister at Holy Family School in Milwaukee, Wisconsin, who had it on display at a local theater. More information about Mercedes McCambridge is available online through the Loyola University Libraries Digital Special Collections or in person through a visit to the Loyola University Chicago Women and Leadership Archives to view her papers. Nathan Ellstrand served as a summer staff at the Women and Leadership Archives during the summer of 2018. 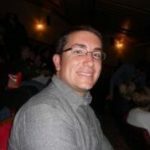 He is a third year PhD student in United States History, interested in twentieth century U.S. political history with connections to Latin America. Away from campus, Nathan enjoys eating (he’s a foodie! ), traveling and riding his bike. This entry was posted in Collections Highlights, Mundelein College and tagged Drama, Film History, Mercedes McCambridge, Oral History, Women's History by Women and Leadership Archives. Bookmark the permalink.